First, for those that don't know what Animorphs are, I will explain. Animorphs are humans that have the ability to morph into Animals by touching and acquiring their DNA. They were given this gift by the Andalites (an alien race). 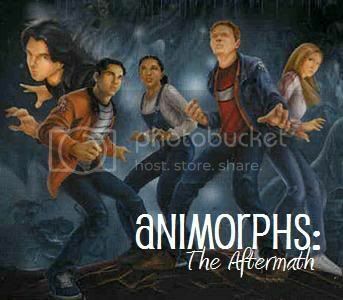 Working together the Animorphs and Andalites attempt to get rid of the Yeerk (another parasitic alien race that crawls into the ear and takes control of the brain). Any human being controlled by a Yeerk is also known as a Controller. That pretty much sums up the main points. Crayak (an evil deity in the series), as those of you that have read the series know, doesn't like losing. He's decided to mess with the timeline a little. You wake up one day, and your world looks like a nuclear holocaust. It gets worse; the Yeerk are back. Everyone you knew is either dead or a Controller. There are only small resistance factions in the major cities around Canada and the US. Cassie, who survived, leads one. You will join one led by the admins or anyone else who has been given a leadership position. what about Melissa are we aloud to play ics that aren't Animorphs. If so I'd like to play Melissa Chapman. Can she be an Animorph?